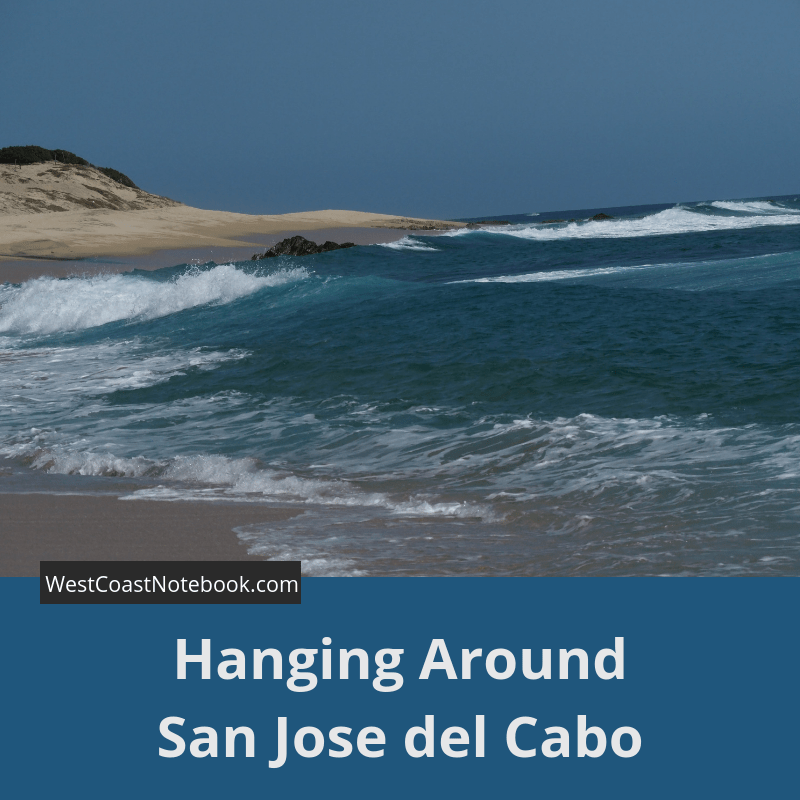 Today we spend hanging around San Jose del Cabo while we wait to go to the chiropractor on Monday morning. So, it was a day of relaxing and basically doing nothing, but we still had an adventure nonetheless. As mentioned in my last post we slept in and didn’t get out of the airport hotel until noon. 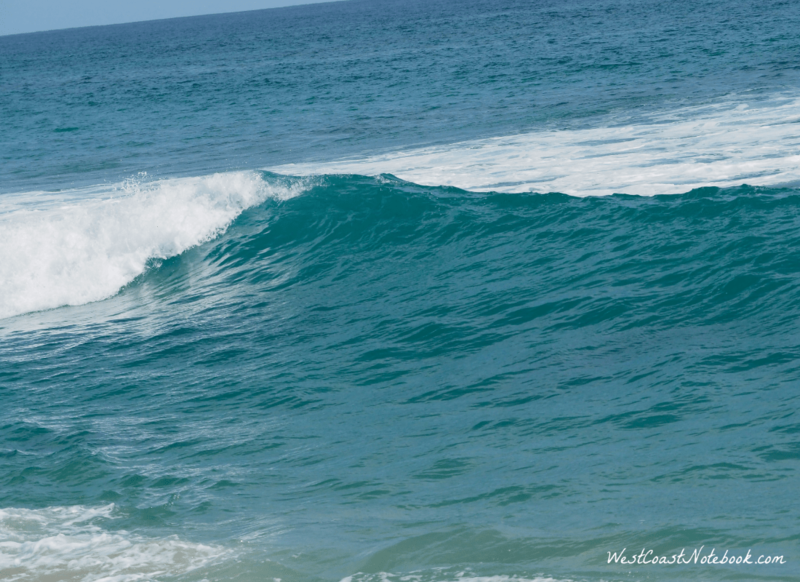 Driving through San Jose del Cabo I just couldn’t face another day in town so we headed out along the inside coast… destination Cabo Pulmo. This is supposed to be a beautiful park that has the only hard coral reef in North America. Meandering down the winding road we saw big, big houses and large fancy yachts. It appears this is where the rich and famous live when in the Baja. The further we got out of town the more cows we met on the road and instead of rows of houses, there were communities. The communities were fairly new with large adobe style houses and dirt washboard roads. Someone with a grader could make a killing. The houses themselves would probably go for a million dollars as they looked over the Sea of Cortez. The Sea of Cortez is very different than the Pacific Ocean on the outside of the Baja like Todos Santos. It’s a turquoise greenish blue and clear and clean. It is like looking at a jewel. Driving along, the road turned into brand new cement. There was a circle turn about (in the middle of nowhere) with a big sign that said the name of the town. But… the town wasn’t built yet, the infrastructure was just being put in place and from what they were doing on the outside, the prices on the inside would not be for the average earner. The cement road when on for about 5 miles and then turned back into asphalt. About three-quarters of an hours drive from San Jose del Cabo we saw a sign that said 71 km to Cabo Pulmo. And then the pavement ended. Dirt road all the way. Driving a little further we decided that maybe today wasn’t the day to go to Cabo Pulmo and we found a beach and spent the afternoon watching whales breach. 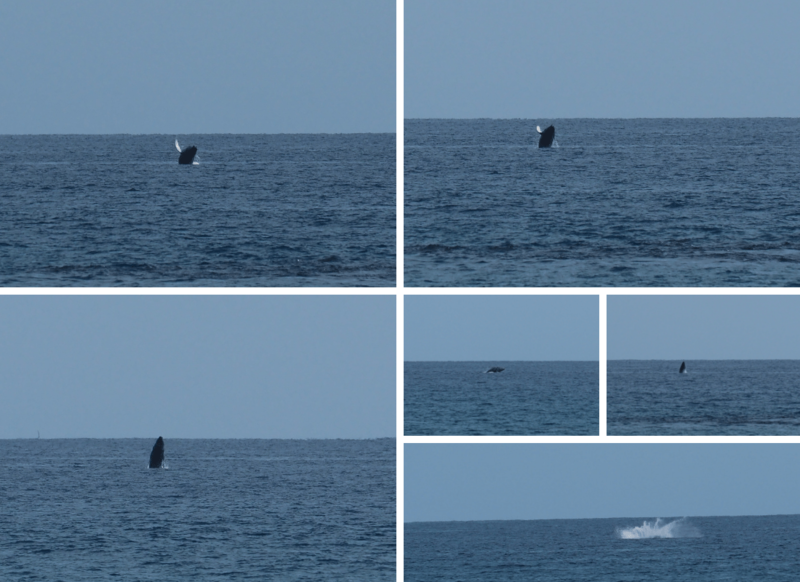 I wish they were closer to shore but they were awesome nonetheless. It was wonderful. We walked, relaxed and sat and did nothing else all day. Come back into town we got a room at the same hotel we had on the first night. Same up and down stairs and hallways but now we were on the next floor up. Before we even took our bags up to the room we headed across the street for dinner. Now there are no sidewalks that we’ve seen here yet and people just randomly jump off the curb and saunter across the street. Even if the light is green. So, we just jumped into the throng and went across the 6 lanes of traffic. Finding a little restaurant next to the sushi place we sat down for dinner and a funny thing happened. But first, I have to take you back to our last trip to Arizona. During that trip, we stopped at a craft fair and I bought a magnetic bracelet that was supposed to be good for carpal tunnel and arthritis. When I wear it near any electronics like my computer it just shuts them down so Rob has been wearing it for his arthritis. Rob reaches across the table and immediately all the silverware is sucked up into the bracelet leaving him to pluck it off in order to eat his meal. This may not seem funny to you, but it had me in stitches because of a video I had watched by Jeanne Robertson. She is my favourite comedian and here is the clip as she tells it way better than I can. Back at the hotel, we figured that we could find our room quite easily as the number was just above what we had before, but do you think we could find it? We went up and down corridors and stairs until finally, we had to ask one of the porters who showed us the hidden location for… you guessed it… a tip. We got all our luggage up to the room only to discover there are no towels. I head back down to the office. If you remember from our first trip it was 1/2 a block away from reception up 4 flights of stairs, down multiple halls that had up and down ramps in them. Ask for towels (so sorry they will send some up) and phone… a shrug of the shoulders. Someone brought up the towels (another tip). Then we discovered there were no blankets and I didn’t have the internet password. No phone, so back down the stairs and halls to reception. Gave me the password but didn’t understand what a blanket was. I tried to pantomime but as I explained to Rob I’m not sure what they will bring. I asked them for some more towels as they only bought a large bath towel, so off they went and brought back another large bath towel and another tip. No washcloths or hand towels in sight and I just wasn’t going to go down that road again. While the porter was here I asked him if he knew how to lock the sliding glass door. Two porters later and no locking in sight. Soon they indicated that they would go and get a screwdriver. At least that’s what I thought he meant and it turns out I can read sign language pretty well. One man came back with a screwdriver and made a gallant effort to get the door to lock until after about 15 minutes I just said it was fine and to leave it. And I offered him a tip. He refused as he hadn’t fixed it, but he worked so hard to do so, I insisted he take it. So, here we lay on the fourth floor with no phone, two large towels, a tv that only gets Spanish, one thin blanket and a door that doesn’t lock and a balmy 22 degrees.